A-HOTEL.com - Luxury and cheap accommodation in Prigorodnoye, Russia. Prices and hotel, apartment booking in Prigorodnoye and surrounding. Hotel on Khankalskaya 104 is located in Groznyy, 5 km from Akhmat-Arena, and offers free WiFi. The accommodation provides a 24-hour front desk. Thelocal Hotels Grozny is located in Groznyy and has a fitness centre, a shared lounge and a bar. Each guest at the 5-star property can enjoy city views from the rooms, and has access to a hot tub. Hotel Hollywood 2 offers accommodation in Groznyy. Free WiFi is featured throughout the property and free private parking is available on site. Situated in Groznyy, within 2.3 km of Akhmat-Arena, Апартаменты 9 Ночей на Л. Located in Groznyy, within less than 1 km of Akhmat-Arena, Apartment on Umara Sadaeva offers accommodation with free WiFi and air conditioning. This property offers access to a balcony. 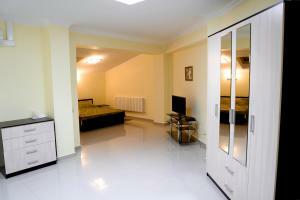 Apartment on Bulvar Dudaeva is set in Groznyy. Guests staying at this apartment have access to a fully equipped kitchen and a terrace. Set in Groznyy, within 1.4 km of Akhmat-Arena, Apartment on Dyakova offers accommodation with free WiFi and air conditioning. Guest House Sputnik is situated in Groznyy, 3.4 km from Akhmat-Arena, and offers free WiFi.